An abridged version of this recording is available on Nonesuch Records (one CD). 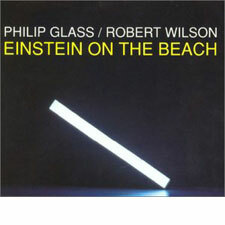 Einstein on the Beach (1976) is a pivotal work in the oeuvre of Philip Glass. It is the first, longest, and most famous of the composer’s operas, yet it is in almost every way unrepresentative of them. Einstein was, by design, a glorious “one-shot” — a work that invented its context, form and language, and then explored them so exhaustively that further development would have been redundant. But, by its own radical example, Einstein prepared the way — it gave permission — for much of what has happened in music theater since its premiere. Einstein broke all the rules of opera. It was in four interconnected acts and five hours long, with no intermissions (the audience was invited to wander in and out at liberty during performances). The acts were intersticed by what Glass and Wilson called “knee plays” — brief interludes that also provided time for scenery changes. The text consisted of numbers, solfege syllables and some cryptic poems by Christopher Knowles, a young, neurologically-impaired man with whom Wilson had worked as an instructor of disturbed children for the New York public schools. To this were added short texts by choreographer Lucinda Childs and Samuel M. Johnson, an actor who played the Judge in the “Trial” scenes and the bus driver in the finale. There were references to the trial of Patricia Hearst (which was underway during the creation of the opera); to the mid-’70s radio lineup on New York’s WABC; to the popular song “Mr. Bojangles”; to the Beatles and to teen idol David Cassidy. Einstein sometimes seemed a study in sensory overload, meaning everything and nothing. A recording cannot capture the spectacular visual imagery that Robert Wilson devised for Einstein on the Beach but it should be said immediately that this was much more than the usual uneven collaboration between a librettist and composer. From its beginnings, worked out between Glass and Wilson over a series of luncheons at a restaurant on New York’s Sullivan Street almost 20 years ago, this was truly a team effort. At this time, Glass was writing long concert pieces for the Philip Glass Ensemble — most recently Music In Twelve Parts (1974) which might be considered Glass’s “Art of the Repetition” — while working as a plumber and driving a taxi. “Foundation support was out of the question, of course,” he recalled. “And most of my colleagues thought I’d gone completely off the wall.” Still, by the mid-’70s, the Ensemble had built a cult following in the lofts and galleries of Manhattan’s nascent Soho district, and Glass had begun amassing credits as a theater composer by providing scores for the experimental Mabou Mines Company (of which his first wife, JoAnne Akalaitis, was a founding member). Glass, became aware of Wilson’s stage work during an overnight performance of the twelve-hour Life and Times of Josef Stalin, presented at the Brooklyn Academy of Music in 1973. He was attracted to what he called Wilson’s sense of “theatrical time, space and movement.” The two men promptly determined to collaborate on a theatrical opus based on the life of a historic figure. Wilson proposed Chaplin, then Hitler; Glass countered with Gandhi. 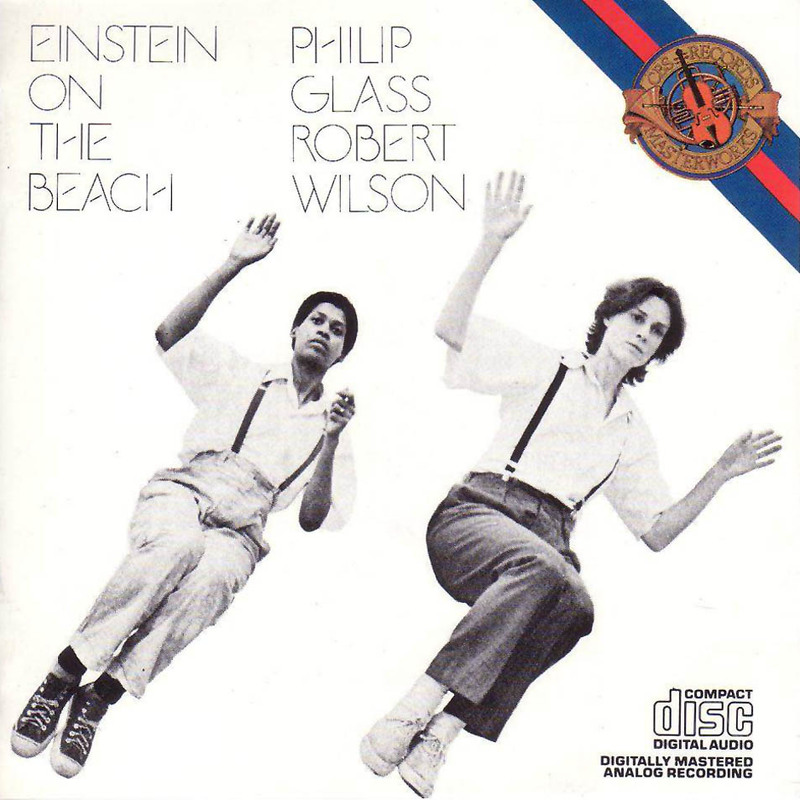 Finally, Glass and Wilson agreed upon Albert Einstein, and the name of the as-yet-unwritten work became “Einstein on the Beach on Wall Street.” The title was later shortened; neither creator now remembers when or why. The Glass-Wilson opera was intended as a metaphorical look at Einstein: scientist, humanist, amateur musician — and the man whose theories, for better and for worse, led to the splitting of the atom. Although it is difficult to discern a “plot” in Einstein, the climactic scene clearly depicted nuclear holocaust: with its renaissance-pure vocal lines, the blast of amplified instruments, a steady eighth-note pulse and the hysterical chorus chanting numerals as quickly and frantically as possible, it seemed to many a musical reflection of the anxious, fin-de-siècle late ’70s. Einstein on the Beach brought the composer fame — and notoriety. It was presented throughout Europe in the summer of 1976, then brought to the Metropolitan Opera House for two sold-out performances in November 1976. Then, as later, audience response was mixed; Glass’s works were presented to boos and bravos. Jane Herman, the presenter responsible for bringing Einstein to the Met, has vivid memories of her first encounter with the Glass/Wilson opera. “Anthony Bliss had just taken over as the Met’s general manager and he wanted something to fill the house when the company wasn’t performing,” she said. “Jean Rigg, the administrative director of the Merce Cunningham troupe, told me about Einstein and I went to see a runthrough in downtown Manhattan — five full hours, without break — and I liked it very much. So I reported back to Tony and he called [director] John Dexter in London who said if Robert Wilson wanted to do it, we should do it. So I flew over and we arranged a contract. And that, as they say, was that. For the 1978 recording of Einstein on the Beach, Glass abridged the score to fit on to four LP discs. The opening scene, for example, was cut from some forty minutes to a little more than twenty by reducing the number of repeats. (Glass likened the process to a friend after a diet: “It’s the same person before and after; there’s just a little less of him.”) Still, that first recording, issued on Tomato and then CBS Masterworks (later SONY), won considerable attention and was long considered definitive. Why, then, a new version? Little has changed in the music itself. Richard Peck’s squalling sax improvisation in the “Building” movement has been replaced by what Glass calls a “very lyrical, bluesy solo.” There is a new violinist (Gregory Fulkerson) on this recording and a new soprano (Patricia Schuman). Most of the speeches are the same, (the late Samuel Johnson’s “All Men Are Equal” replaces his original “Paris” text, and a new actor, Jasper McGruder, has taken over Johnson’s small but crucial roles), and Lucinda Childs and Sheryl Sutton are back to recreate their speaking parts. The score has many beauties: the pulsing, inevitable forward motion of “Train” (with its climactic exploration of a tricky, elegant modulation between F minor and E major, reprised throughout the opera); the slow, droning, quasi-hypnotic use of additive process in “Trial”; the furious, rhythmical reiterations of the dances; the sweet, gently rocking, solfege in the duet, “Night Train”; the loopy “Prematurely Air-Conditioned Supermarket” speech in “Trial 2/Prison” that leads, finally, to one of the most ecstatic outbursts of ensemble playing in the opera; the curious, detaché, aria for solo electric organ and soprano (“Bed”); and then the apocalyptic “Spaceship” movement. Ultimately, “Knee Play 5” brings it all back home and the mammoth opera ends rather as it began. Though he loathes the term, Glass is often classified as a “minimalist” composer. Much of his mature work is based on the extended repetition of brief, elegant melodic fragments that weave in and out of an aural tapestry. Listening to his music has been compared to watching a modern painting that initially appears static but metamorphoses slowly as one concentrates. Particularly in his early works, Glass limited compositional material to a few elements, which were then subjected to a variety of transformational processes. A listener quickly learned not to expect Western musical events -sforzandos, sudden diminuendos. Instead, one was immersed in a sort of sonic weather that twists, turns, surrounds, develops. Since the mid-1960s, Glass had based much of his music on two central techniques: additive process and cyclic structures. Additive process involved the expansion and contraction of tiny musical modules; a grouping of five notes might be played several times, then followed by a measure containing six notes (similarly repeated) then by seven notes, and so on. “A simple figure can expand and then contract in many different ways, maintaining the same general melodic configuration but, because of the addition or subtraction of one note, it takes on a very different rhythmic shape,” Glass explained. Indeed, it is not Einstein but Satyagraha (1980) that marks the first of Glass’s more-or-less “traditional” operas (insofar as an opera without linear narrative, with a text in Sanskrit and based directly on the Bhagavad Gita may be considered “traditional”). As opposed to the spartan Einstein, composed for the Philip Glass Ensemble, Satyagraha was scored for more conventional forces: strings, woodwinds in threes, organ, six solo singers and chorus of forty. While Einstein challenged ideas about what an opera — even an avant-garde opera — should be, Satyagraha neatly fit Glass into the operatic continuum. Einstein threw out the rules with modernist zeal: Satyagraha adapted the rules to the composer’s own esthetic. It was difficult to find any historical precedent for Einstein; in Satyagraha one may find references to many of the composer’s predecessors. And yet Glass insists there is a strong connection between Einstein, Satyagraha and Akhnaten (1983). “Each of the three operas of this portrait trilogy has its own distinctive sound world,” Glass said. “Einstein on the Beach, an opera about a great mathematician who loved music, is for amplified ensemble and small chorus singing a text comprised of numbers (actually the beats of the music) and solfege syllables. Satyagraha, a work about one man leading his people to freedom, is a large choral opera with text taken directly from Gandhi’s philosophical guidebook in the actual language in which he read it. Einstein on the Beach was revived in 1984, and then again in 1992, by International Production Associates for extended tours, culminating in residencies at the Brooklyn Academy of Music. In 1989, Achim Fryer attempted a new visual interpretation of the Glass music at the Stuttgart State Opera, which was generally judged unsuccessful. It is in its original form — as a joint venture between Glass and Wilson — that Einstein has become one of the most famous operatic events of the century. An Opera in four acts for ensemble, chorus and soloists. Music & Lyrics: Philip Glass. Design & Direction: Robert Wilson. Performed by The Philip Glass Ensemble: Michael Riesman: musical director, keyboards. Gregory Fulkerson: violin. Jon Gibson: soprano saxophone, flute. Martin Goldray: keyboards. Kurt Munkacsi: sound design. Richard Peck: alto & tenor saxophones, flute. Andrew Sterman: flute, piccolo, bass clarinet. Chorus: Sopranos: Marion Beckenstein, Lisa Bielawa, Michèle A. Eaton, Kristin Norderval. Mezzo-sopranos: Katie Geissinger, Margo Gezairlian Grib, Eisa Higby. Tenors: Jeffrey Johnson, John Koch, Eric W. Lamp. Baritones: Jeff Kensmoe, Gregory Purnhagen, Peter Stewart. Soprano soloist, “Bed”: Patricia Schuman. Spoken text: Lucinda Childs, Gregory Dolbashian, Jasper McGruder, Sheryl Sutton. Spoken text authors: “Prematurely Air-Conditioned Supermarket” by Lucinda Childs. “All Men are Equal”, “Two Lovers” by Samuel M. Johnson. “Text: Knee Play 1”, “Crazy Eddie”, “Mr. Bojangles”, “Text: Knee Play 2”, “I Feel the Earth Move” by Christopher Knowles. Produced by Kurt Munkacsi and Michael Riesman for Euphorbia Productions, Ltd., NYC. Recorded January-June 1993 at The Looking Glass Studios, NYC. Engineers: Dante DeSole, James Law. Assistant: Benno Hotz. Mixed by Michael Riesman at The Looking Glass Studios. © 1976 Dunvagen Music Publishers, Inc. © 1993 Nonesuch Records.